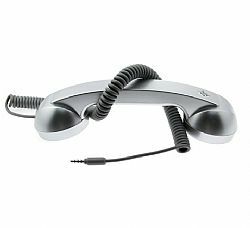 The Native Union Pop Phone (in metallic Aluminum) is a simple, covetable handset that can plug into any mobile phone, tablet or PC. The nostalgic look of the Retro handset plays on a chunky, old-fashioned telephone receiver design, but combines the comfort and convenience of these traditional handsets with modern functionality, including a high-quality speaker and microphone and easy-to-use pick-up and hang-up buttons. Just plug the funky phone handsets into any mobile phone, tablet or PC and start chatting - and since all your other mobile functions can still be accessed, it's as simple as that. The Retro handset is compatabile with all 3.5mm phones and devices. Not very clear. Bluetooth ear sets tend to work better. It is comfortable.